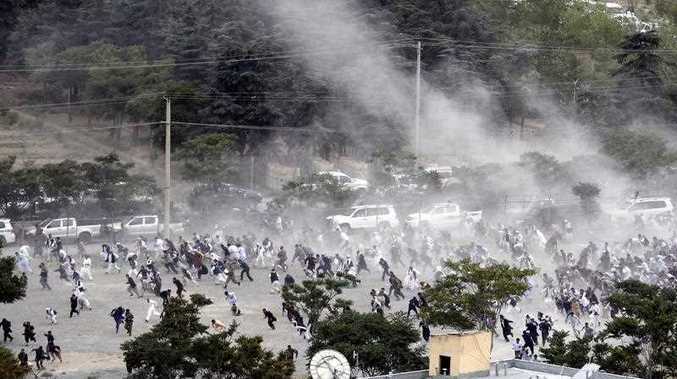 A LEAST 12 people have reportedly been killed and 90 wounded in bombings at the funeral of a protester killed in Kabul. Three blasts hit mourners at a cemetery in the Khair Khana district, where photos showed bodies and remains strewn on the ground as smoke filled the air. 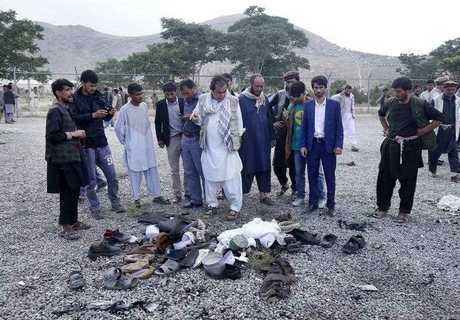 The office of President Ashraf Ghani said he condemned "the outrageous attack on mourners burying the martyred", adding: "The country is under attack. We must be strong and united." Abdullah Abdullah, the chief executive of Afghanistan, was one of several politicians who survived the blasts as they gathered for the funeral of Salim Ezadyar, the son of a senior Afghan senator. Several senior Afghan officials were present, with foreign minister Salahuddin Rabbani and others reported safe following the bombings. Salim was the son of Alam Ezadyar, the deputy speaker of the upper house of Afghanistan's Parliament. He was among protesters shot dead by police at violent demonstrations in Kabul on Friday, Tolo News reported. They were demanding the government improves security following another bombing that killed more than 90 people and injured 450 more in the Afghan capital. Police used water cannons, tear gas and opened fire at protesters who attempted to move closer to the presidential palace. The city's police chief claimed some demonstrators fired weapons in the direction of his officers, while an Afghan MP confirmed at least eight protesters had been shot dead. Demonstrations were continuing for a second day on Saturday, despite calls from officials to disperse, when the new explosions rang out across Kabul. About 200 protesters passed the night under two big tents on a road near the presidential palace and the site of Wednesday's blast, with 200 more joining them during the day. All roads toward the palace and nearby diplomatic areas have been blocked by police and there was limited movement of vehicles and people. Mr Ghani has met with senior security officials in an emergency meeting amid fears over the Government's ability to protect its citizens. A statement from the president's office said officials determined that an investigation must be undertaken to find out what exactly happened that led to the violence and identify those who acted against the law. There has been no claim of responsibility for the atrocity. 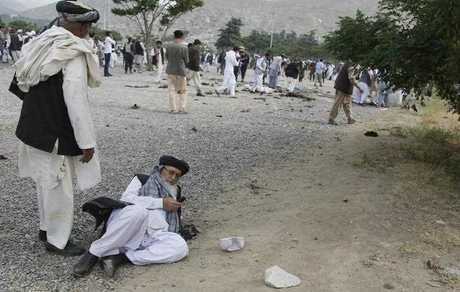 The Taliban denied involvement and said it did not carry out the funeral bombings. Isis has been attempting to expand its presence in Afghanistan, claiming a separate bombing on Wednesday in Jalalabad that killed a Taliban member, and has called for increased global terror attacks during Ramadan. The security situation has continued to worsen - more than 15 years after the US invaded Afghanistan as part of the "war on terror" - forcing Donald Trump to consider sending thousands of American troops to bolster Nato forces. The Taliban has been intensifying its insurgency since the partial withdrawal of international troops in 2014, gaining ground to contest or hold around 40 per cent of Afghanistan. Isis is fighting its rival and the government while attempting to expand its "Wilayat Khorasan" branch and launching a series of deadly terror attacks, including the massacre of more than 50 people at a Kabul hospital in March. The violence and ensuing battles and air strikes caused record civilian casualties in Afghanistan in 2016, when almost 3,500 civilians were killed and over 7,900 injured. The increasing danger has sparked calls for the UK to suspend deportations of failed Afghan asylum seekers to Kabul, which it has declared a "safe" zone.